Orphaned as a child, Annie's special friendship with Alec is a source of strength and security which sees them both through many difficulties in their nineteenth-century Scotland. Alec and Annie eventually are separated by circumstances when he leaves to study medicine at the university. There he meets beautiful Kate and falls helplessly in love. But she rejects him in favor of an arrogant upperclassman. Alec bitterly blames himself for Kate's eventual despair. How will he come to recognize that peace and tranquility, hallmarks of Annie's life, come from within? A few words of introduction about George MacDonald for those of you who are not so familiar with his work (although I think there can't be anyone who isn't). He is a Christian author of the time of Charles Dickens. His works contain literature, essays and poems as well as short stories, fables and parables. Most readers probably know him as the spiritual father of C.S. Lewis, who was urged towards Christianity by reading one of his fantasy books. He then also got the idea of the Narnia books from another fantasy work of MacDonald's called "At the Back of The North Wind", as I recently found out while reading this wonderfully deep and complex book. The editions of his books that I will be reviewing here are simplified from his original works, by Michael Phillips. This particular book's original title is "Alec Forbs". I first read the originals and then bought the Michael Phillips editions because they are by far easier to read and enjoy. The original works usually contain much of the dialogue in a heavy Scottish accent and idioms, which make them quite hard, or sometimes even impossible to understand. However, either way his books are diamonds to collect. You can find and read many of his original works in this link: The Online Books Page. 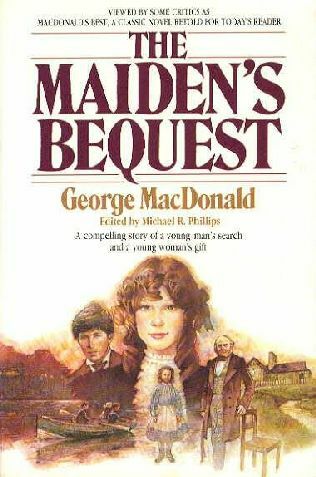 The Maiden's Bequest was the first book I ever read of MacDonald's and it absolutely charmed and delighted me. In some ways it is a Cinderella story. Annie is the poor orphan who is abused and looked down on. Alec is the handsome and protective teenager who always comes to her rescue. So she grows up worshipping him as a god and -unsurprisingly- ends up falling in love with him. But Alec has plans to conquer the world. He goes away and leaves Annie behind to suffer in her unrequited love for him. But soon she discovers the real God and gives her life over to Him. When Alec comes back, he is amazed, impressed and envious. He wants what she has. Alec is a wonderful hero for a book. He is sweet, tender and solicitous, but also enough of a bad boy that it should keep the plot going and the characters realistic. Annie is the heroine we all would like to be. She is quiet and loving and she has an inner strength that never dries up, because she has the Lord. Everywhere she goes, people are touched and transformed by her relationship with God. This is a deep book. It explores the characters' motives, their origins, why they have become what they are and their morals. It also explores many characters' relationships with God and their personal faith. I learn a lot about the Lord every time I open a MacDonald book and this one is no exception. It made me reevaluate my relationship with Him and that is the most precious thing a book can do for you. Well, I'm not familiar with his works. In fact I haven't read Christian authors, specifically. I don't know why because I am anchored spiritually. I will have to check into this genre -- thanks! P.S. What country do you live in -- the writing is all greek to me.